Click here to download an illustrated PDF of this teaching guide. 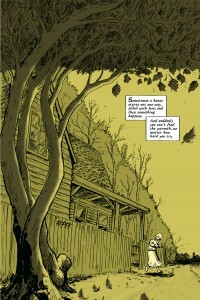 Soupy Leaves Home is a graphic novel written by Cecil Castellucci and illustrated by Jose Pimienta. Set in the early 1930s in the heart of the Great Depression, this is a story about two hoboes: one young named “Soupy,” and one much older named “Ramshackle.” Together they journey south and then “Westward” while healing their hearts, facing their respective demons, and evaluating their paths and dreams. From cover to cover, readers travel with these larger-than-life characters, feeling their pains and their hopes as they grapple with the world around them. In the end, we realize that Soupy, Rammy, and even Professor Jack are a lot like us and that their dreams aren’t much different from ours. As such, this is a book about humanity, about heart and empathy, and the quests we all must travel (whether on trains, by foot, or simply with time) as we find our own truths and love along our individual paths while figuring out who we really are. While only out a few months, this book has received a starred review from Kirkus Reviews, which describes this as “a compelling graphic offering that explores relevant gender roles and self-identity through a historical lens.” This book is an outstanding read for readers 12+. The tragedy of Soupy’s life (at least initially) is somewhat balanced by Ramshackle’s magic. It is this inner magic that draws Soupy to him. Ramshackle seems to see through people’s defenses. He sees their inner beauty and he can make the simplest things (what others might consider garbage or worthless) seem magically special. We learn to trust Ramshackle and his insights as Soupy does. 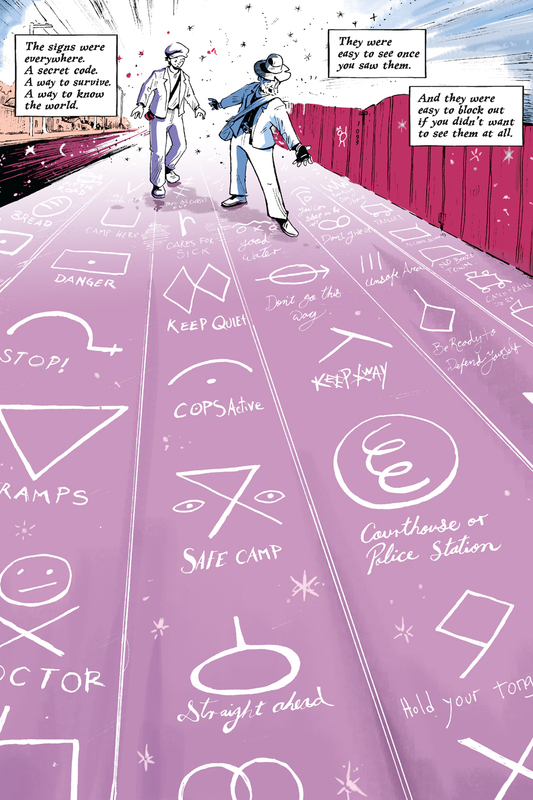 He teaches Soupy how to survive as a ‘bo—how to find defend herself and read hobo signs warning of danger or showing where one might find food or temporary work. And as they travel, Ramshackle helps Soupy find purpose, inner strength, and beauty in the world around her. Soupy, in return, gives Ramshackle strength, love, and purpose when he needs it most. While crossing the country we learn more about Soupy, Ramshackle, and hobo life during the Great Depression. We learn that after her mother died, Soupy’s father was so grief-stricken he couldn’t contain his anger, which he took out on Soupy. 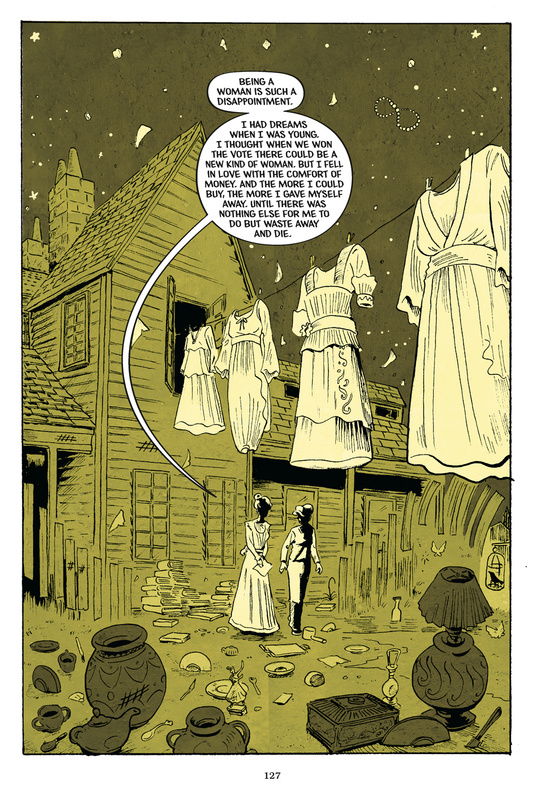 We learn of Ramshackle’s life—of his wife and child whom he left years ago. We learn that while he tried to return to them, it just didn’t work, and to find his own inner peace, he finds solace by helping others. We also meet other supporting characters on the trains or in “hobo jungles” that are equally mysterious and faceted. One character in particular is “the Professor,” a young hobo scarred inside and out, ostracized after being accused of breaking the Hobo Code for stealing and ratting on others. It is Ramshackle, however, who sees the Professor (and Soupy) for who they are and who helps guide all to see the truth. Unfortunately, Ramshackle is ill and must head “westward”—he leaves his unfinished “work” to Pearl and Professor Jack. 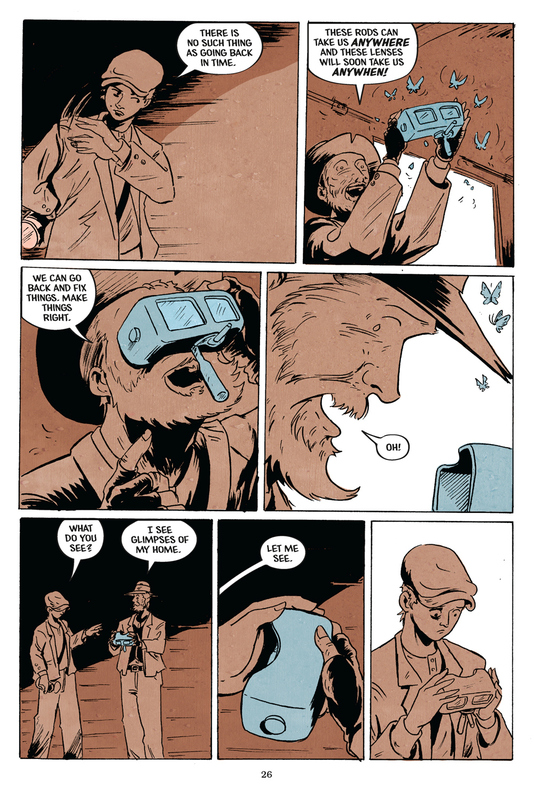 Soupy’s story is told through sensitive, insightful dialogue and narrative as well as through image, color, and page/panel design. While clearly and convincingly set in the 1930s, the story, character, and dialogue, are timeless. Castellucci’s text is moving, engaging, and weighty with nuance and meaning. Along with the narrative and dialogue, Castellucci introduces wonderful pieces of history, adding depth to the story and its characters—from the Hobo Signs and slang, to the Code of the Road (the ethical code created by Tourist Union #63 at the Annual Hobo Convention in the late 1880s), and snippets of songs from the 1930s, reflecting the trials and tribulations of the Great Depression. These contributions make Soupy’s story truly come to life. 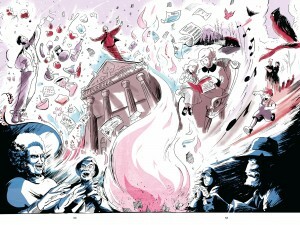 Then there are Pimienta’s images and brilliant use of color. 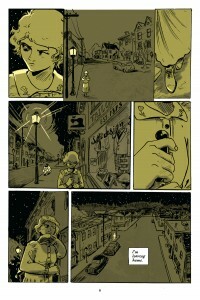 While most of the panels are monochromatic, color is inserted with great intention and effect. Nights are dark and olive green when depicting melancholy; dark and purple when depicting the majesty of the great outdoors and nature; dark and blue when depicting sadness or cold fear; or dark and red when depicting or alluding to danger and/or violent thoughts or actions. Days are equally depicted in light shades of drab olive, depicting dust, dirt and destitution, or icy whites and blues signifying cold, fear, or loneliness. And then there is Ramshackle’s magic when he relays memories, insights, love, or special thoughts. At these times bursts of colors, shapes, and flying swirling images set against a bright white background truly support the magical feelings they elicit. The book’s power lies both in its moving story and its insights into life. The fact that things are rarely as they seem—from initial impressions, to stereotypes about hoboes and tramps, to relationships or expectations of what girls and boys can or cannot do. We learn to see people as diverse and multifaceted, and we learn the powers of love, trust, and helping others. Discuss what might make a young person run away from home. Discuss the dangers involved. Discuss what other options Pearl might have had and/or options one might have today. Discuss the characters’ choice of Hobo names (for example: Soupy, Ramshackle/Rammy, Gums Magee, Tom Cat Tuna, and Professor Jack). Discuss why hoboes might have chosen to create new names. Have students come up with names for themselves, explaining (as a writing assignment) why they’ve chosen that particular name. You may also want to have them create a visual sign or “crest” that visually expresses who they are. Discuss why Pearl hid her gender and what might have happened if she hadn’t. Why did she feel she had to? Are things different today? Why and why not? 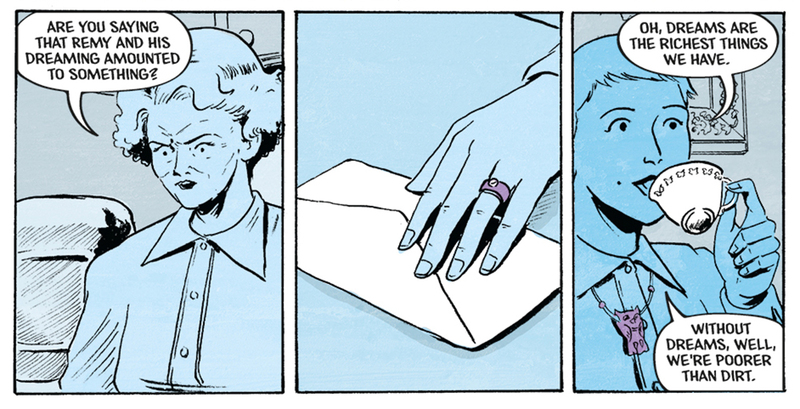 On page 127 Pearl’s mother tells her, “Being a woman is such a disappointment. I had dreams when I was young. I thought when we won the vote there could be a new kind of woman. But . . .” Discuss Pearl’s mother’s options when she was a young woman. Discuss Pearl’s options. Discuss how things did and did not change from mother to daughter. Discuss how things did and did not change in our culture today. Analyze and compare gender equality of the 1930s versus gender equality issues today. On pages 7–9 Pearl tells us, “Sometimes a house starts out one way, filled with love, and then something happens. And suddenly you can’t find the warmth, no matter how hard you try . . . This is the story of how I became warm again.” Discuss what makes a house warm, and what makes it cold, frightening, uninhabitable. Discuss what one might do to make things better. On page 187 Pearl tells Rammy’s wife, “. . . Dreams are the richest things we have. Without dreams, well, we’re poorer than dirt.” Discuss what she means. Discuss the power and perils of dreams. On pages 26–27 Rammy finds a broken ViewMaster with which he pictures all kinds of Christmas wonders. Pearl can’t seem to see anything through the ViewMaster. Then, on page 29, she thinks, “Maybe the way to see starts by sneaking into your dreams.” Discuss what she means by this. How might dreams help us see? 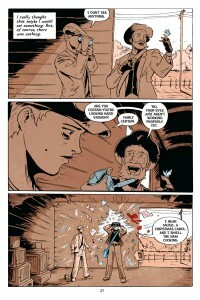 On pages 32–33 Rammy asks, “Do you know how to defend yourself? . . . Well, I’m not saying to throw the first punch . . . You prepare your mind so that you don’t crumble.” Discuss what Rammy means and how one might best “prepare” to defend oneself? Research and discuss the “Code of the Road” ethical code (mentioned on pages 39–43) created by Tourist Union #63 at the Annual Hobo Convention in the late 1880s. Discuss the purpose and intent of this code and how it may or may not be applicable to life today. On page 58 Rammy says, “Nothing is ever garbage unless you say it’s so. You’re just looking at this wrong.” Discuss what Rammy is trying to tell Pearl and how Pearl (and others) might look at various things (“garbage,” “life”) differently. Discuss why and when it is beneficial to look at things differently. Discuss why it is that Rammy sees things so differently from others. Trust is an important theme throughout this book. Discuss how some trust more and trust differently than others. Discuss why, for example, Pearl says to the doctor on page 73, “It’s hard to trust people to do anything,” and the doctor responds, “I hope you grow out of that one day, boy. Trust in trust. It’s a fine thing.” Evaluate and discuss the different characters’ levels of trust. Discuss about how lying can hurt. Discuss for example what Pearl says on page 178: “A liar, when caught, is an obvious thing. Or, rather, once you see what a liar looks like, you can’t unsee it.” Discuss how lying can erode trust. Discuss what Pearl means when she says on pages 79–80, “Folded into the worst news, or the worst days, there are still moments of beauty . . . Small things like a piece of kindness . . .” Have students brainstorm and evaluate moments of beauty in their lives and/or stories or history. On page 136 Pearl realizes, “Once someone is considered bad people, no matter what they do, it looks bad.” Discuss and evaluate this with your students. You may want to use this to look at historical and/or fictional characters. Discuss how one might change opinions. Have students search for and reflect upon Castellucci’s uses of language, literary devices, and imagery to tell the story. 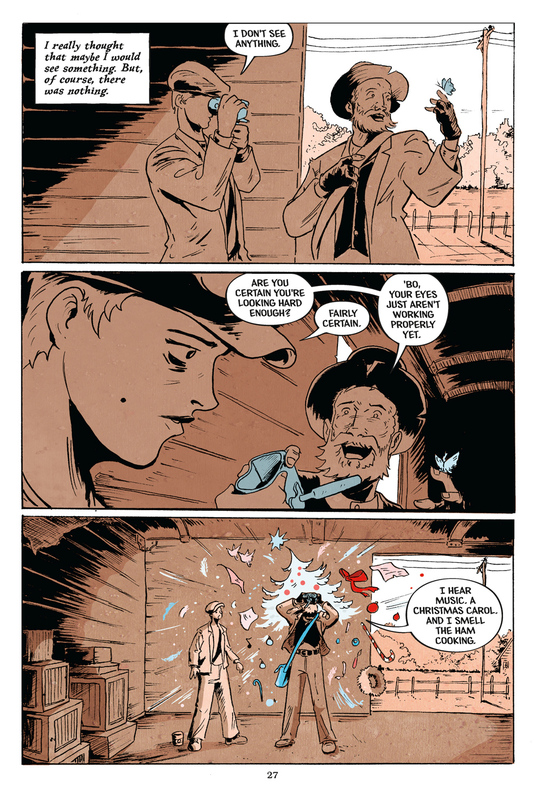 Castellucci includes a lot of period-related hobo signs and language/jargon. Have students search for instances of this jargon (for example: jungling, jungle buzzards, flop bum versus hobo versus tramp, etc.) while creating their own Hobo Dictionaries (optional: these can include images as well as words to define the jargon). Have students study and evaluate the language of hobo signs Castellucci and Pimienta introduce us to (as found throughout the book and through links provided in the resources). 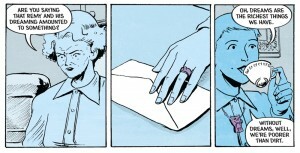 On page 55, Castellucci provides us with various descriptions of how hungry Pearl was. Have students think about times when they were really, really hungry. Have them try to describe it. 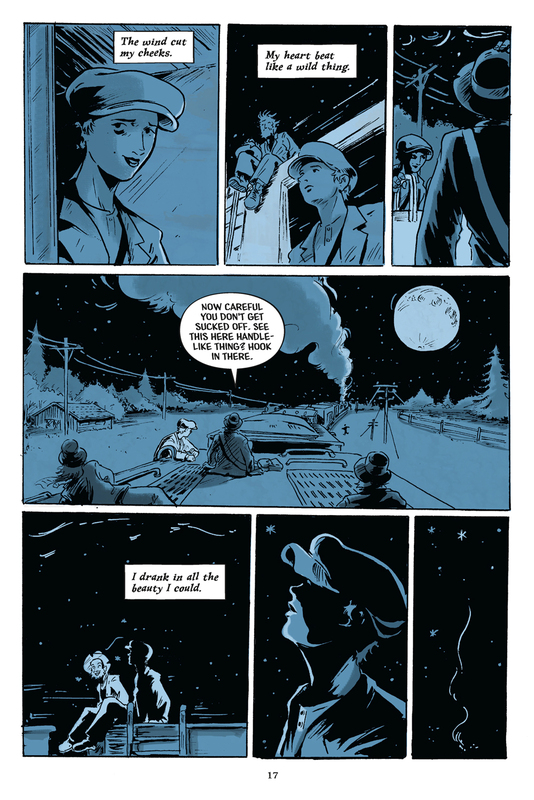 On pages 104–105 Soupy tells us, “I think the saddest lands have the most beautiful sunsets. The rocks and the dirt, they don’t have much else. Just like the saddest hearts are warmed by the tiniest and brightest of moments, just to get through the next one . . . .The land is just so sad it breaks my heart.” Evaluate and discuss Soupy’s sentiments—evaluating “the saddest lands” and “the saddest hearts.” You may also want to discuss how these sentiments are relayed in text versus image (with just whites, greens, and a hint of violet). Why did they decide to use these specific colors? You may want to follow this up by having students describe and/or draw their saddest moments. Discuss Castellucci’s and Pimienta’s uses of language and imagery on page 169 as she writes, “There’s a moment in every person’s life when they emerge, like a chrysalis from a cocoon. 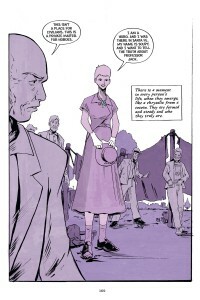 They are formed and steady and who they truly are.” Discuss why Pearl thinks this. Discuss whether you think it’s true or not. When/how is it true? When/how is it not always true? In Soupy Leaves Home most of the hoboes have an opinion of Professor Jack based on the way he looks. Discuss this with students along with a discussion on how cultural differences play into this as well. Discuss how different cultures have dealt with runaways and with the homeless. Discuss how this book may have helped your students better understand the impact of abuse and the plight of the homeless. Discuss what civic responsibilities we have for our homeless and how you and your students might be able to contribute and help. Research and discuss how the Great Depression affected families and family life. [See suggested resource links.] How was Pearl’s life similar/different? Research the incidents and demographics of hoboes in the 1930s. Note that while there were women, a bobbed haircut (like Soupy’s) was considered scandalous, as was wearing men’s clothing. Even a woman going to college was “weird” (or at best progressive). Discuss women’s roles and fashions in the 1930s. What was a “Modern Woman” (and “Modern Man”) in the 1930s? How have Modern Men and Women changed/not changed today? Set up a chart with five columns: Page; Panel; Verbal Storytelling; Visual Storytelling (use of color, design, images); Silent Storytelling (i.e. characters thinking, emoting, reflecting). You may want to define and discuss the power of this silent storytelling that allows readers—along with Soupy—to rethink and review the world around her. Have students chart what is told through words and what is told through image, color, and page/panel design. You may want to break your students into groups and divide the book among those groups—or you may want to simply begin the exercise and see how far they get. Note that if you have students evaluating the same pages, you may get more opinions and deeper follow-up discussion based on their different perspectives. Review what students found. Discuss the nuances found along with the pros and cons of verbal and of visual storytelling. 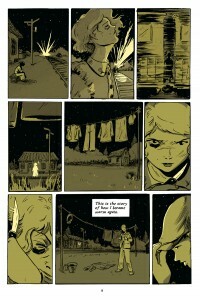 Color plays a huge role in the storytelling here. While the color palette is often limited (often using just one color as background), there are moments when the color bursts (often relaying Rammy’s whimsy and fantastical look at life). Throughout the book color is used to relay mood, whimsy, and magical realism. Discuss the different moods, emotions, and information the colors relay. Discuss how the magical realism of Rammy’s world and of his character (as a visionary, a dreamer, and a man at the end of his life coming to terms with the past and the future). Discuss/evaluate how color here is almost like a character in the book. As Pearl first meets Rammy she thinks, “. . . [H]e’s some kind of strange beast. Like a yeti. Or a Sasquatch. But of course, looks can be deceiving.” Discuss the power of appearances and images and how they often shape first (and at times lasting) impressions. Have students consider what different “looks” mean and how these “looks” are used to judge people, places, books, toys, food, etc. You may want to chart their responses for these different categories to consider underlying themes or trends. Evaluate and discuss the instances of magical realism. You may want students to search and find these instances themselves or assign them specific pages (such as pages: 15, 23,25–29, 52–53,60, 65, 79, 86–87, 113, 152–153, and 180—to list just a few). Note how text, art, and design are used to relay the Hobo Code of the Road on pages 39–43. Evaluate and discuss how each of these storytelling mediums tells the story and helps us relate more closely to the characters and content. Pages 128–129 explode with passion as Soupy reveals and faces her demons. For example, her father and grandmother are huge, larger than life, and cannot fit completely on the page; her dad’s hand is raised to hit her; on one page, their faces ooze rage, and on the other we see the hope in Soupy’s heart as she struggles to come to terms with everything. Discuss the use of text and image to relay this very powerful scene and how the visual and verbal storytelling allow us not only to understand, but to feel Soupy’s state of mind. Look through/read/pair the list of books found in the back of the book that inspired Castellucci and Pimienta and that “Soupy is reading.” You may want to discuss how Soupy might react to them and you might want to evaluate how they may have influenced/inspired Soupy Leaves Home. 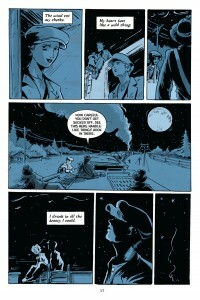 Nowhere to Call Home by Cynthia DeFelice is about Frances who must cope with the hardships of the Great Depression. After losing the family’s money and assets to the crash, Frances’s dad takes his life. Devastated and bereft, Frances trades in her dress and railway ticket to her aunt’s house, for trousers, a cap, and a chance to ride the rails. There she meets hoboes Frankie Blue and Stewpot. Frances learns how to survive but eventually realizes that life traveling the rails is not anywhere near as glamorous or fulfilling as it initially appeared to be. 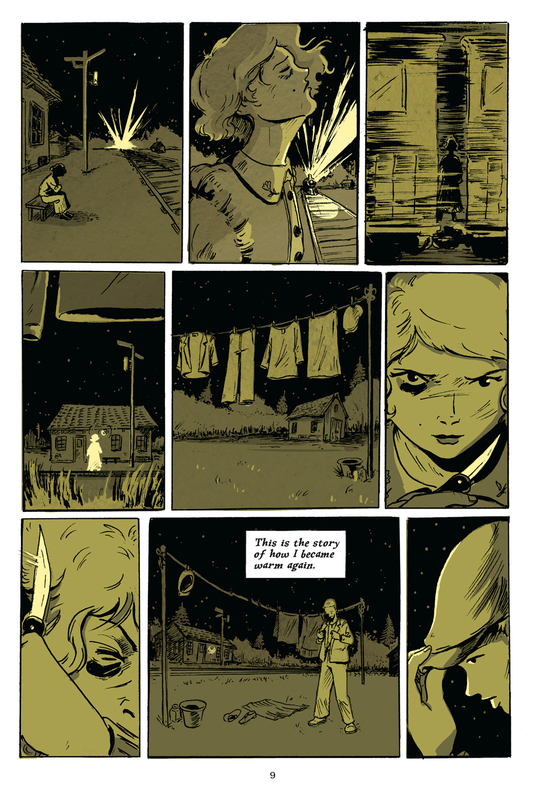 Kings in Disguise by James Vance is an award winning graphic novel (winner of Eisner and Harvey Awards), a coming of age story about 12-year-old Freddie Bloch who finds himself homeless in Detroit’s winter of 1932 after his dad disappears and his brother gets arrested. Hitting the railcars in search of his father, Freddie meets Sam, a hobo, and together they explore America. The Grapes of Wrath by John Steinbeck, about migrant workers, footloose lifestyles, and a classic, heartbreaking look at life in Great Depression America. The Plain Janes, Odd Duck, and Shade the Changing Girl, all graphic novels by Cecil Castellucci about being different, and/or containing strong female characters. 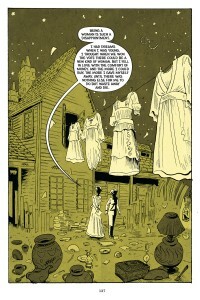 Compare and contrast Castellucci’s stories, the language, and the use of art. A Room of One’s Own by Virginia Woolf, containing Ms. Woolf’s thoughts and reflections on what women need to become professional writers of fiction. Note that this book is listed in the back of Soupy Leaves Home as inspiration for this story, and discussions can easily center around the obvious influences it had. Rolling Nowhere: Riding the Rails with America’s Hoboes by Ted Conover. First Vintage Departures Edition, 2001. Nonfiction concerning the author in the early 1980s riding the trains and interviewing hoboes. In his second edition the preface discusses the death of hoboes and how/why things changed. Citizen Hobo: How a Century of Homelessness Shaped America by Todd DePastino. This book grew out of the author’s dissertation, which discusses how hoboes (and homelessness) were the impetus for significant social reforms in 20th Century America including Roosevelt’s New Deal and the post-war GI bill. DePastino also explores the literary treatment (and romanticism) of the open road. 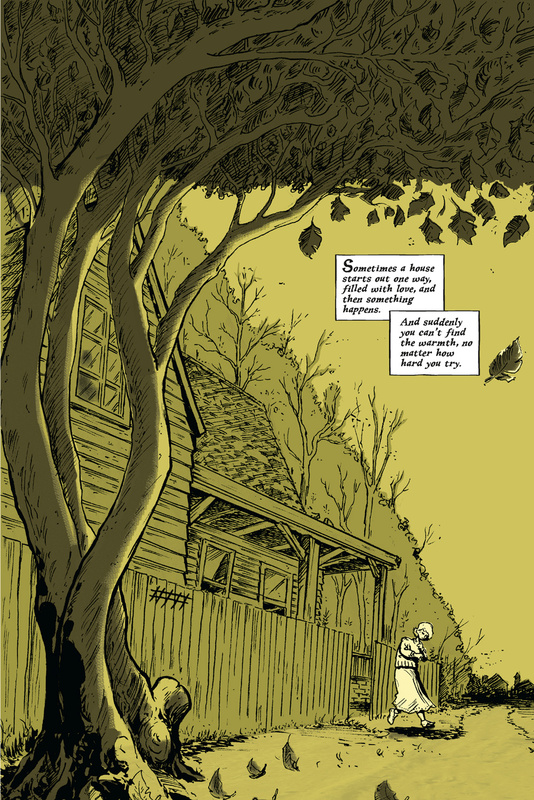 Soupy Leaves Home is full of literary devices, verbal imagery, wordplay, inferences, nuanced characters, and humor. It deals with issues of identity, stereotyping, and setting/breaking expectations. It sensitively deals with issues that permeated the 1930s as many still do today (homelessness, domestic abuse, stereotyping, etc.). It can be deftly and effectively integrated into middle and high school language arts and social studies classrooms. It promotes critical thinking, relays issues of civic and ethical responsibilities, describes the language (verbal and sign) and lifestyles of hoboes (past and present), and its graphic novel format provides verbal and visual storytelling that addresses multi-modal teaching. As a result it meets Common Core State Standards for language arts as well as for social studies. As it can be used for a range of ages and grade levels, the section below explores its use in enacting Common Core Anchor standards and with social studies standards identified by The National Council for the Social Studies. Knowledge of Language: Apply knowledge of language to understand how language functions in different contexts, to make effective choices for meaning or style, and to comprehend more fully when reading or listening. Not only can this book be used to analyze and reinforce modern vocabulary and word use, it can be used to evaluate hobo signs and language as well for a discussion on the role of words and images for effective communication. Vocabulary Acquisition and Use: Determine or clarify the meaning of unknown and multiple-meaning words and phrases by using context clues, analyzing meaningful word parts, and consulting general and specialized reference materials; demonstrate understanding of figurative language, word relationships, and nuances in word meaning; acquire and use accurately a range of general academic and domain-specific words and phrases sufficient for reading, writing, speaking, and listening at the college and career readiness level. This can also be explored using Castellucci’s modern language as well as exploring hobo jargon. Key ideas and details: Reading closely to determine what the text says explicitly and making logical inferences from it; citing specific textual evidence when writing or speaking to support conclusions drawn from the text; determining central ideas or themes and analyzing their development; summarizing the key supporting details and ideas; analyzing how and why individuals, events, or ideas develop and interact over the course of the text. Due to the limited amount of text and prominent use of color and image, Soupy Leaves Home provides a concrete medium and unlimited opportunities for students to explore the differences between key ideas and details. Craft and structure: Interpreting words and phrases as they are used in a text, including determining technical, connotative, and figurative meanings and analyzing how specific word choices shape meaning or tone; analyzing the structure of texts, including how specific sentences, paragraphs, and larger portions of the text relate to each other and the whole; assessing how point of view or purpose shapes the content and style of a text. Here too, because the storytelling in Soupy Leaves Home employs limited amounts of text and prominent use of color and image, this provides a concrete medium and unlimited opportunities for students to explore the craft and structure of its storytelling. Integration of knowledge and ideas: Integrate and evaluate content presented in diverse media and formats, including visually, as well as in words; delineate and evaluate the argument and specific claims in a text, including the validity of the reasoning as well as the relevance and sufficiency of the evidence; analyze how two or more texts address similar themes or topics in order to build knowledge or to compare the approaches the authors take. 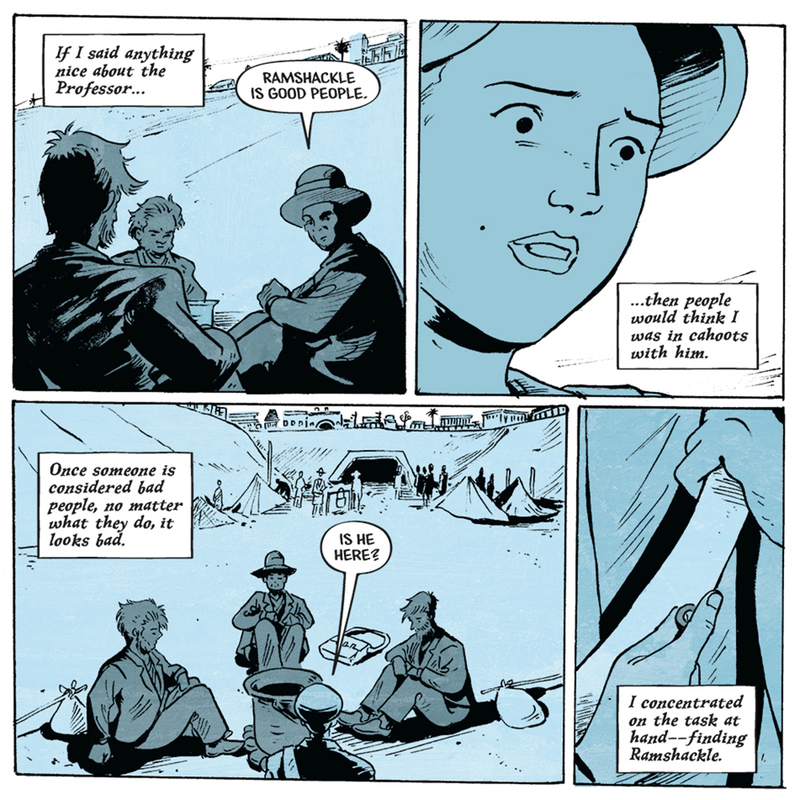 Graphic novels by definition explore the use of diverse media formats. 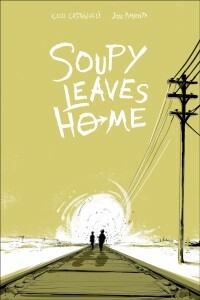 Soupy Leaves Home, with its use of hobo language and signs, provides an even more diverse format. Range of reading and level of text complexity: Read and comprehend complex literary and informational texts independently and proficiently. While there is a limited amount of text, the vocabulary, text complexity, and language usage in Soupy Leaves Home is quite sophisticated. As a result it appeals to a wide range of student language learners. Comprehension and collaboration: Prepare for and participate effectively in a range of conversations and collaborations with diverse partners, building on others’ ideas and expressing their own clearly and persuasively; integrate and evaluate information presented in diverse media and formats, including visually, quantitatively, and orally; evaluate a speaker’s point of view, reasoning, and use of evidence and rhetoric. These skills are addressed both in the book itself, as we see various forms and formats for collaboration among and between characters, as well as in many of the discussion/writing prompts above. Culture and Cultural Diversity – “. . . [S]tudents need to comprehend multiple perspectives . . . to consider the strengths and advantages that this diversity offers to the society in general and to their own growth . . . to analyze the ways that a people’s cultural ideas and actions influence its members . . .” In Soupy Leaves Home not only are the characters diverse but the theme of cultural/gender differences are a major theme of the book. Time, Continuity, and Change – “. . . [F]acilitate the understanding and appreciation of differences in historical perspectives and the recognition that interpretations are influenced by individual experiences, societal values, and cultural traditions . . . examine the relationship of the past to the present and extrapolating into the future . . . provide learners with opportunities to investigate, interpret, and analyze multiple historical and contemporary viewpoints within and across cultures related to important events, recurring dilemmas, and persistent issues, while employing empathy, skepticism, and critical judgment . . .” As Soupy Leaves Home depicts hoboes in the early twentieth century, it provides an excellent format to evaluate time, continuity and cultural change. Individual Development and Identity – “. . . [D]escribe how family, religion, gender, ethnicity, nationality, socioeconomic status, and other group and cultural influences contribute to the development of a sense of self . 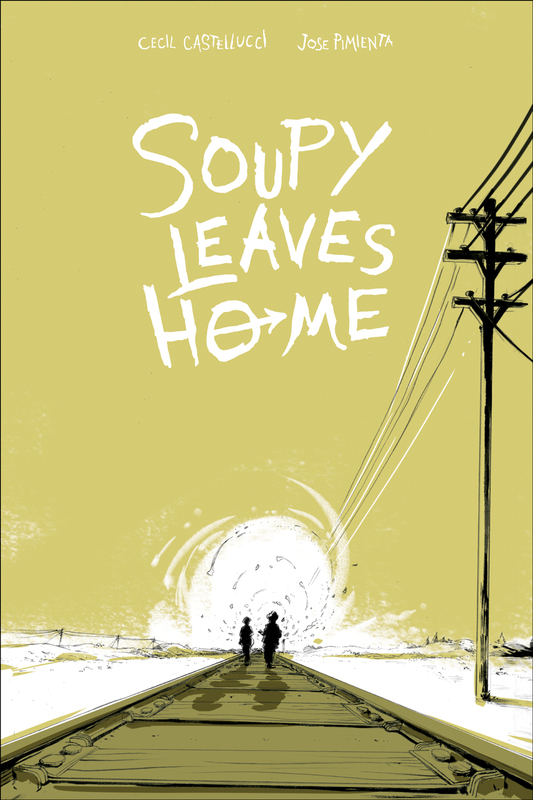 . . [H]ave learners compare and evaluate the impact of stereotyping, conformity, acts of altruism, discrimination, and other behaviors on individuals and groups . . .” Soupy Leaves Home is all about how characters grow and change as they face their own dreams and realities. Individual development and identity are major themes of the book. Power, Authority, and Governance – “. . . [U]nderstanding the historical development of structures of power, authority, and governance and their evolving functions in contemporary American society . . . enable learners to examine the rights and responsibilities of the individual in relation to their families, their social groups, their community, and their nation . . . examine issues involving the rights, roles, and status of individuals in relation to the general welfare . . . explain conditions, actions, and motivations that contribute to conflict and cooperation within and among nations . . . challenge learners to apply concepts such as power, role, status, justice, democratic values, and influence . . .” After reading Soupy Leaves Home readers can evaluate not only how hoboes governed themselves, but how government institutions helped and/or failed hoboes, particularly in the 1930s. Civic Ideals and Practices – “[A]ssist learners in understanding the origins and continuing influence of key ideals of the democratic republican form of government, such as individual human dignity, liberty, justice, equality, and the rule of law . . . analyze and evaluate the influence of various forms of citizen action on public policy . . . evaluate the effectiveness of public opinion in influencing and shaping public policy development and decision-making . . .” Here too, civic ideals and practices (in the 1930s versus now) are also major themes found in this book. Homelessness in America: sponsored by National Coalition for the Homeless and found at: http://nationalhomeless.org/about-homelessness/ detailing why people are homeless, with additional links for factsheets; for those who need help; with research on homelessness; and how to take action and help. The National Domestic Violence Hotline http://www.thehotline.org/is-this-abuse/abuse-defined/, defining domestic abuse with an excellent infographic on how issues of power and control can lead to various forms of physical and sexual violence. Meryl Jaffe, PhD teaches visual literacy and critical reading at Johns Hopkins University Center for Talented Youth Online Program. She is the author of Worth A Thousand Words: Using Graphic Novels to Teach Visual and Verbal Literacy (Wiley, 2018), Raising a Reader: How Comics and Graphic Novels Can Help Your Kids Love to Read (Comic Book Legal Defense Fund, 2013), and Using Content-Area Graphic Texts for Learning (Capstone, 2011). She used to encourage the “classics” to the exclusion of comics, but with her kids’ intervention, Meryl has become an avid graphic novel fan. She now incorporates them in her work, believing that the educational process must reflect the imagination and intellectual flexibility it hopes to nurture. Please visit Dr. Jaffe at meryljaffe.com with your own comments or questions. All images copyright Cecil Castellucci and Jose Pimienta. 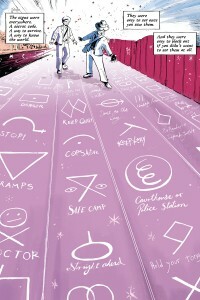 PDF graciously provided by the Dark Horse Comics.